Come visit the British Ceramics Biennial at the Spode Works in Stoke over the weekend. 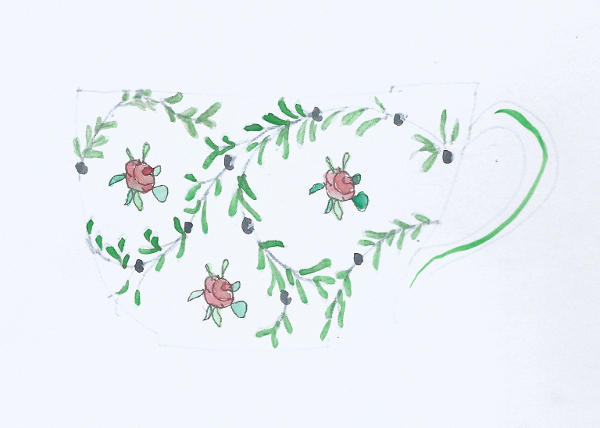 I’ll be working there – on imaginary tea sets, not real ones, for a change. 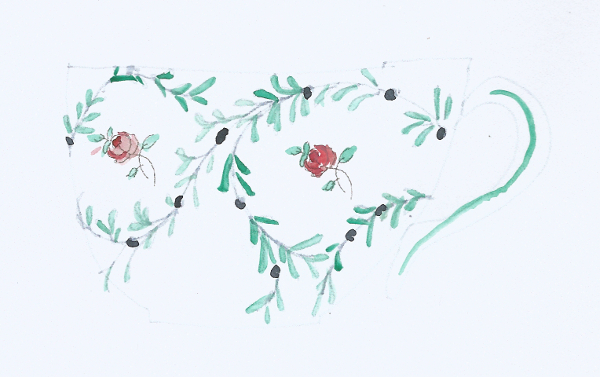 Come along and try imagining your own personal china – I will have Spode patterns as well as my own that you can use – or invent your own. Or just come for a chat. 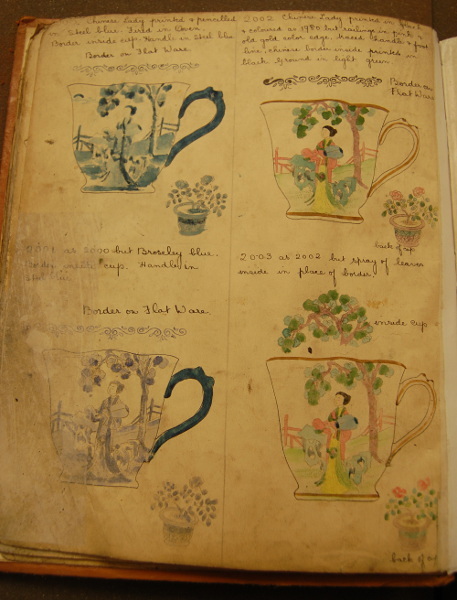 As I wrote last week, I’ve been looking at Spode and New Chelsea pattern books. I noticed that the most interesting ones used the ‘decals’ – the transfers that go on the pots – then show the multiple variations. 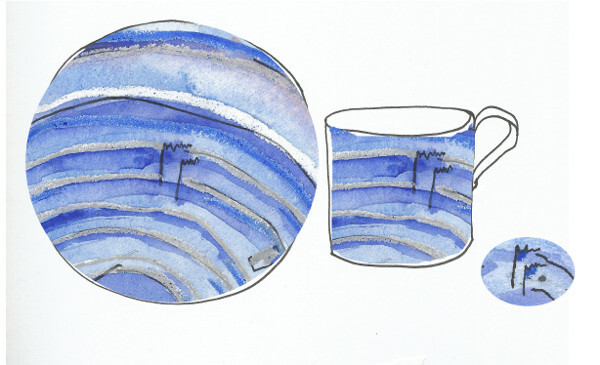 I’ve been developing my own imaginary tea-sets, re-using images and parts of images, but adding colour and variation. The images are sourced from my old and new sketchbooks – partly to create new content with my own copyright (can’t be too careful), partly to create a sense of patterns developing over time by using older and newer images. There’s so many possibilities that I’m already having to hold myself back from developing too many. 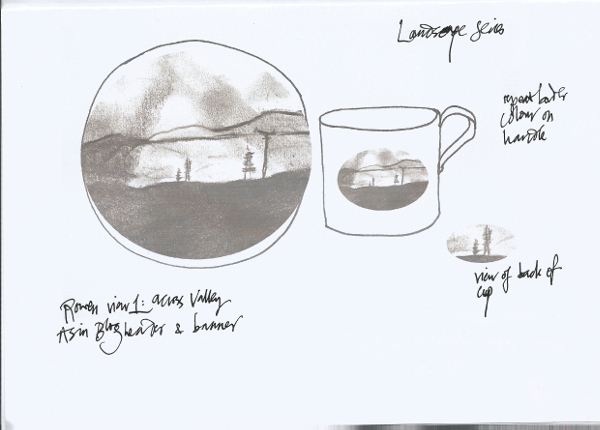 It’s a strange process: starts with drawing, the scanning and sizing on the computer, then printing and colouring with paints, and writing with quill and ink. The more processes the image gets, the more interesting: these are just the start..
– “the process of pushing a work of art or craft from the physical world to the digital world and back again—maybe more than once”. I love this idea: it’s what they were doing at New Chelsea, if you substitute lithographs for digital. There’s a synthesis of machine and hand which is, to me, at the heart of craft, but which allows for the right use of machines. The craft comes from looking hard at each thing made, and evaluating where its specialness lies: the eye monitors and assesses both the hand and the machine and makes choices. 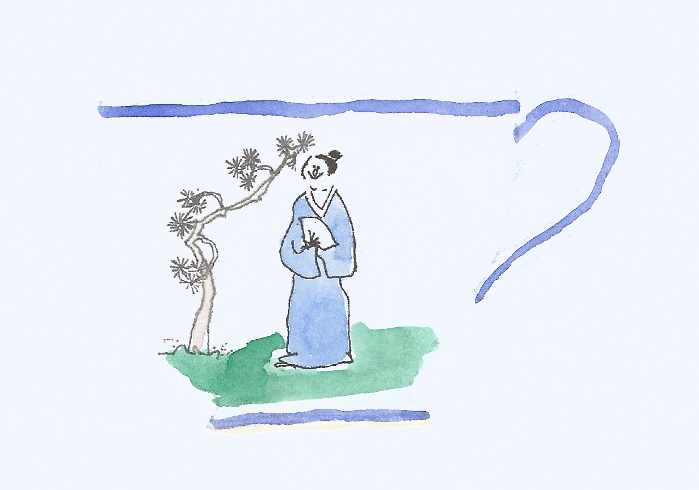 I’ll also be showing some patterns where the imaginary china is printed with watercolours I’ve made of my own, hand-thrown work. I’m wondering if this is the same kind of thing as Sophie Conran’s tableware slip-cast in moulds from a handthrown original. More flip flop dancing!